• Introduction to Digital Logic. • 74 Series standard logic gates. AND, OR, NAND, NOR, XOR, XNOR, NOT. • Truth tables for standard logic functions. • Boolean laws and rules. • Software for Boolean simplification. Section 2.5 Digital Logic Quiz. • Test your knowledge of Digital Logic. Digital logic is the foundation, not only of computing but also many other electronic devices and control systems found in almost every part of modern life. This module introduces the basics of digital logic and shows how the whole of digital electronics depends on just seven types of logic gates, connected together with a minimum of additional components. 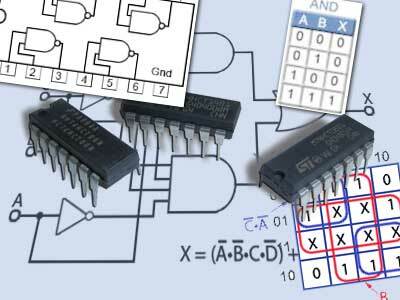 Combinations of logic gates then form circuits that can perform specific tasks within larger circuits or systems. The process of producing complex circuits using combinations of basic devices is called Combinational Logic. There are many ways that a number of logic gates can be combined to perform a specific task. They may all work, but some combinations will perform the task that better than others. For example, a circuit designer may want to design a combinational logic circuit that uses the minimum number of gates, or performs the required task in the least time, or at the minimum cost. This module also introduces the way digital logic gates work and teaches you key methods by which a basic digital logic circuit design may be minimised, made more efficient and/or cheaper.